Classes start in September and run for 32 weeks. Snowbirds are welcome to join us for the first semester. Fees are paid in two installments (one in September, one in February). Club dances are usually 2 to 2.5 hours long, and (usually) cost $5. Do I have to wait until September to dance? No! We sometimes start a second class in February if there are enough dancers ready to sign up. We also hold intro sessions for prospective dancers. To find out about these events, get on our mailing list here. No! Casual dress is fine. 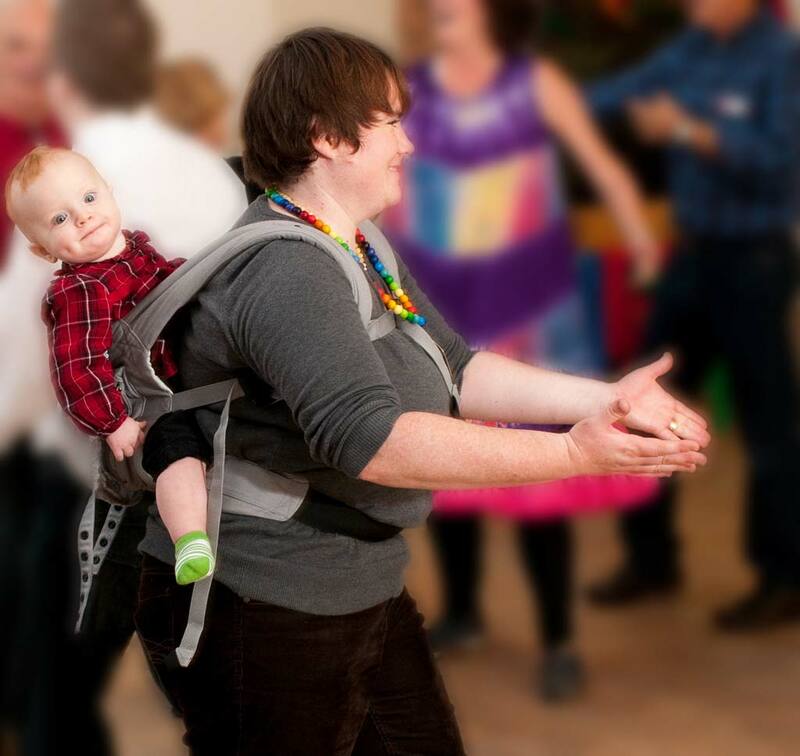 But you’ll find that square dancing is very energetic, so it’s a good idea to wear lightweight clothing, or layers. We suggest that you bring an extra shirt or a T to change into, if necessary. You don’t need one. You’ll be dancing with different people all the time. That’s why square dancing is such a great way to make new friends. No problem! It’s really walking, not dancing. You don’t have to memorize routines. A caller will tell you what to do, and you walk in patterns. And the thing to remember is that everyone makes mistakes, even experienced dancers. Some of the best laughs come when we break down a square. Everyone thinks that square dancing = country music. Not true! Yes, you’ll hear some country, but we dance to everything from pop and rock to all-time standards, with some Country and Western thrown in. You’ll hear songs by Taylor Swift, Adele, N’ Sync, Katy Perry, Lady GaGa, Madonna, Deadmau5… etc. Wow, yes! Dancing is great for your body and your mind. Square dancing has all of the positives and none of the negatives. It’s fun and engrossing, so you won’t even know you’re exercising. It’s low impact, but it’s definitely aerobic (you really do need that extra shirt we mentioned!). It’s good for my brain too? Of course! When you learn to dance, you learn a new language… for your body. You get a mental vacation when you’re square dancing, because you can’t think of anything except how much fun you’re having. 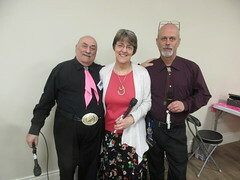 Square dancing is called in English everywhere in the world. 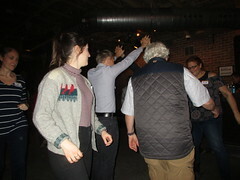 So, once you learn to square dance with us, you can dance anywhere. 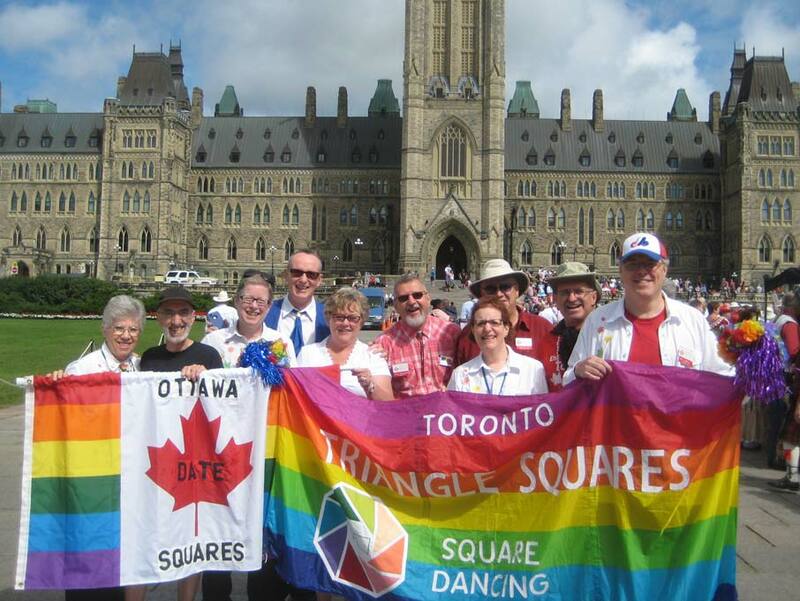 Who are Triangle Squares members? We’re everybody. Anyone who wants to square dance can join. Triangle Squares is open to all. We are an LGBTQ club, so our membership is primarily gays and lesbians. It’s an annual weekend-long mini-convention. The name comes from the fact that dancers usually have to travel (fly) to the event. Triangle Squares hosts a fly-in every year. Clubs all over the United States hold fly-ins too, and many of our members go to them. Convention is HUGE… and it’s coming to Toronto in 2016! It’s the party to end all parties! This is a weekend-long event, and it attracts dancers from around the world. It’s held in a different city each year. In 2014, we went to Salt Lake City, Utah, and in 2015, the host city was St. Louis. 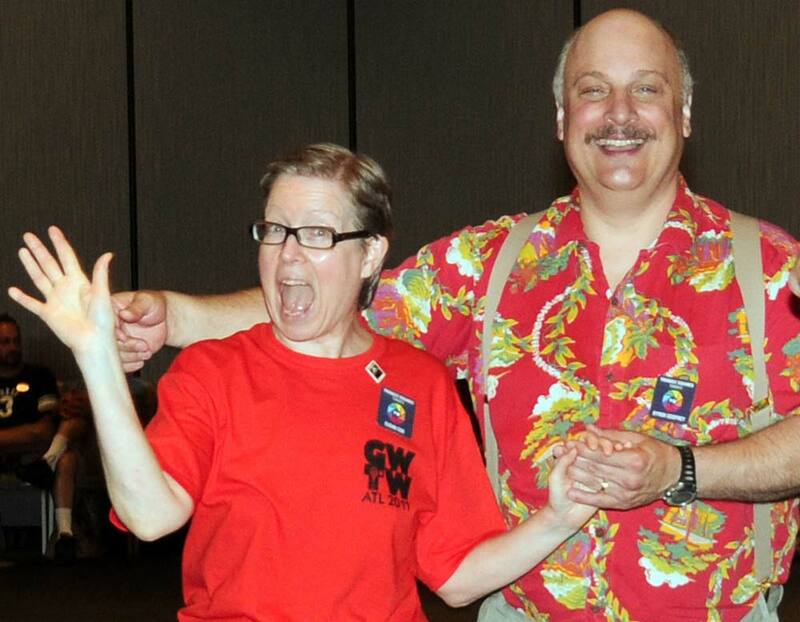 Check out our photos from past conventions. First-year dancers can attend Convention, and they pay the lowest rate. Convention also includes a special school for newbie callers, at a ridiculously low price. 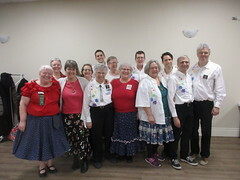 The International Association of Gay and Lesbian Square Dance Clubs (IAGSDC) is the organization of gay square dance clubs in Canada, the US, and around the world.